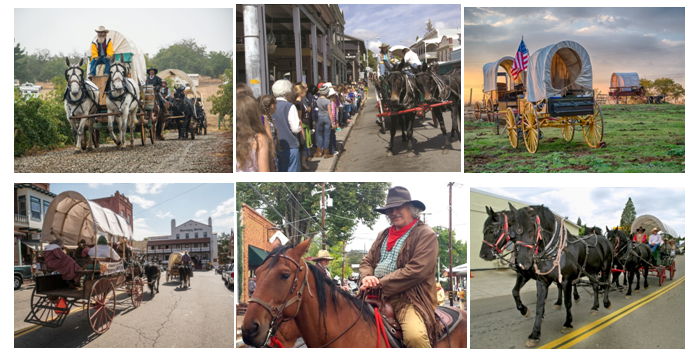 The Kit Carson Mountain Men Wagon Train and Days of 49 Celebration, April 24 – 28, 2019, bring Gold Rush history alive in charming, historic Amador County. This year the authentic wagon train of 16 horse-drawn covered wagons will kick off Wednesday in Ione, CA, for a 5-day journey, through the towns of Plymouth, Drytown, Amador City and Sutter Creek, to Jackson for an all-day celebration of California’s pioneer heritage on Saturday. The colorful Kit Carson Mountain Men sixth living history wagon train re-enactment through the Gold Country, where everyone is invited to “rendezvous” with the horse-men and -women at stops and encampments along the way. The public is invited to join the wagon train afternoons and evenings for barbecue dinners and casual entertainment. Admission is free to all events. The Wagon Train departs from the Howard Park in Ione, headed to Main Street for a community photo and visit with the Wagon Train. Then it’s on to the Amador County Fairgrounds, 18621 Sherwood St., Plymouth for the night. Visit the Wagon Train at the Fairgrounds, 5 – 8 pm, for casual barbecue. Thursday morning the Wagon Train will make a loop through Plymouth to wave to the children at the Plymouth Elementary School, stop on Main Street and drive through 49er Village RV Resort before heading off to Drytown via ranch roads. The Wagon Train will stop on Spanish Street in Drytown for a visit and photos, and then head to a nearby ranch for a private encampment. Old Highway 49 will become the Wagon Train trail. Amador City is the first stop for a visit (and photos!) with the Wagon Train. Continuing the drive on back roads, the train will stop for a late lunch in Sutter Creek before their final leg up to the Italian Picnic Grounds, 581 Hwy 49, Sutter Creek, for a sunset barbecue, music, square dancing demonstration, 5 – 9 pm. The Wagon Train begins the morning travelling through beautiful ranch land off Ridge Road. They will visit with residents at Oak Manor Retirement Complex next to the Amador Senior Center in Jackson and continue through Jackson before camping at the historic Laughton Ranch, (90 Clinton Road, Jackson, across from Raley’s). All day (10 am – 5pm), Laughton Ranch will be hosting Gold Rush family entertainment with Living History activities, petting zoo, food vendors, Old West Variety Show and, of course, the Wagon Train and the teamsters’ beautiful horses and authentic wagons. Saturday evening, 5 – 9 pm, the fun continues with a Barn Dance and barbecue. The Wagon Train returns to Main Street, Jackson, at 11 am with the entertaining Wagon Train Parade of horses, wagons and pioneer fun. At the end of the parade, the Wagon Train will stop for photos and a meet and greet with the Kit Carson Mountain Men and wagoneers. This free, community-wide celebration highlights Amador County’s historic Main Streets and California’s pioneer history.